The Van, Brienne, is the fifth member of our family and this is her page. When we decided that we were definitely going to make this trip happen, the first order of business became finding the right vehicle. As with any vehicle purchase, the capabilities of the vehicle needed to match our intended uses. For us, having the two kids (ages 2 and 4) dictated many of the decisions. Our end goal of spending much of our time “off the grid” defined most of the remaining criteria. Our goal to have an off-road capable vehicle really narrowed down the options. Although there are several models of full size 4×4 RVs out there, they are quite rare with limited engine choices and floor plans. Realistically our choices were between a slide-in truck camper and a camper van. Initially we leaned towards the truck camper because we figured that we could use the truck all the time even when we weren’t hauling the camper and it would also give us nearly unlimited choices in vehicle and engine combinations. However, the final deciding factor was the ability to have access to the majority of our gear/food/toys from the cabin of the vehicle. The van gave us that freedom. So we began to research 4×4 camper vans which led us to Sportsmobile. 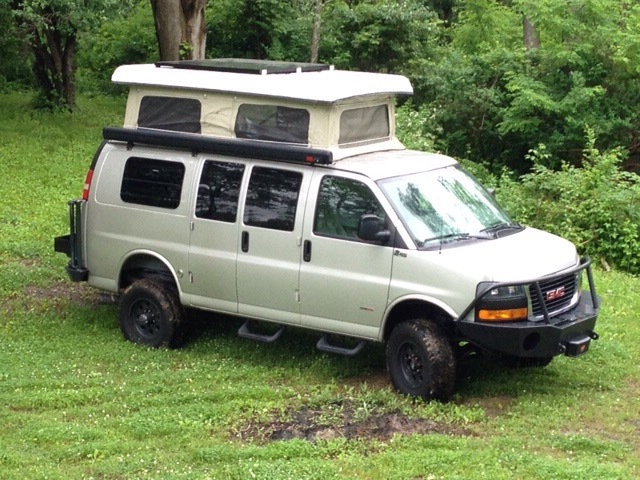 After several months of web research and forum lurking we knew what we wanted, a Chevrolet or GMC 3500 (1 ton) regular body van with a Duramax diesel and 4×4 conversion. Amazingly, the perfect vehicle showed up on Sportsmobile’s website over the Easter weekend. The rest, as they say, is history.